Yummy. Cute and quirky. Happy. 2. How did you come up with the name "Yumstie Tree"? Yumstie is a made up word I use to describe something that I love… I suppose its kind of something that is better than yummy. The name Yumstie Tree happened after I made one of my early greetings cards; a blue tree with red hearts. I designed it, stitched it, thought that it was a yumstie tree, and so it became my logo. 3. If you could put your products on the shelves of any 3 stores, which ones would you choose? 4. I know that you just participated in Craft2.0 Christchurch, how was it? Would you recommend participating in these types of events? And do you have any tips or must do's that you can pass on to our readers? The biggest tip I would say is to have fun and enjoy it. Be yourself. Craft 2.0 was awesome. This is the first craft fair that I have done, so I’m no expert, but I really would say that any crafter should get involved in events like these. The whole day, and the build up to the day, was fantastic. I loved seeing what the rest of the city was making, and having everyone together under the same roof was inspiring. The whole place was glowing with talent and it was a huge success. The biggest tip I would say is to have fun and enjoy it. Be yourself. Ooh and make your stall look pretty and eye catching. 5. How do you come up with your lovely designs? I usually just sit down with a huge pile of different coloured felt in front of me, and try to play about with colours and shapes and not think too much about the end design. I just stitch away and then some how what I create seems to end up looking quite cute. I have days when I try to come up with new ideas and it just doesn’t happen and then other days when I can sit down and within a couple of hours I have come up with 3 new designs that I love. There really isn’t much of a recipe to follow. 6. What's your background? Did you go to art school? Where did you learn your craft? Do you do this full-time? My mum was definitely the one that taught me how to sew. I didn’t go to art school and haven’t had any formal training really. I have been sewing since I was quite small, probably about 6 or 7 years old. My mum was a seamstress, so we always had a sewing machine in the house, well actually a sewing room, not just a machine. So, mum taught my sister and me to sew pretty early on. I made clothes for my dolls, knitted scarves for my teddy bears and stitched bags to put my nanna’s hair curlers in. My mum was definitely the one that taught me how to sew. I didn’t go to art school and haven’t had any formal training really. I once did a textiles and dress course, but the idea of me following a pattern to make something often results in disaster or me losing interest in the project. I usually make something and if it works I then create a pattern and template for it afterwards. I have only been selling my work for the last couple of years, and it was always something I did on top of full time employment. But, I’ve recently been lucky enough to take some time out of work and so I’m starting to give craft my full attention. I’m not making a living out of it yet, but fingers crossed it will grow and grow. 7. You recently made the transition from making your items only for your friends and family to over 15+ stockists carrying your cards. Was it a slow transition? Or did it all kind of just fall into place one day? Can you map out your initial success stories? How did you do it? It kind of all just fell into place really. I came up with a set of hand sewn Christmas cards about 2 years ago and friends said that I should have a go at selling them. I was really happy with the designs, so I took myself into a local shop and they placed an order there and then. I still sell to them now. I then tried a few more shops in the area and the same thing happened. So within a couple of weeks I had 3 shops stocking my cards. I just kept with the 3 shops for a year or so, simply because I didn’t really have the time to supply any more. But since I left full time work, I have managed to increase the number of shops I supply to around 20 and I’m still trying to add more to the list. 8. What was it that made you want to start creating? Do you feel like you were born with a desire to create or did something trigger it? I think my mum was probably the main trigger that got me creating things. We always had fabric, tubs of button and zips lying around our sewing room, and that just tempts you into making things. Sewing in particular has always been something that I really enjoy doing. So adorable and such a great background in sewing with her mom. I love that! Great interview!! 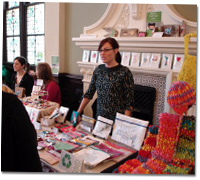 I loved her comments about the craft fair...I'm going to participate in my first one this winter!